Remember the cliff hanger from last week? 1 Remember the cliff hanger from last week? 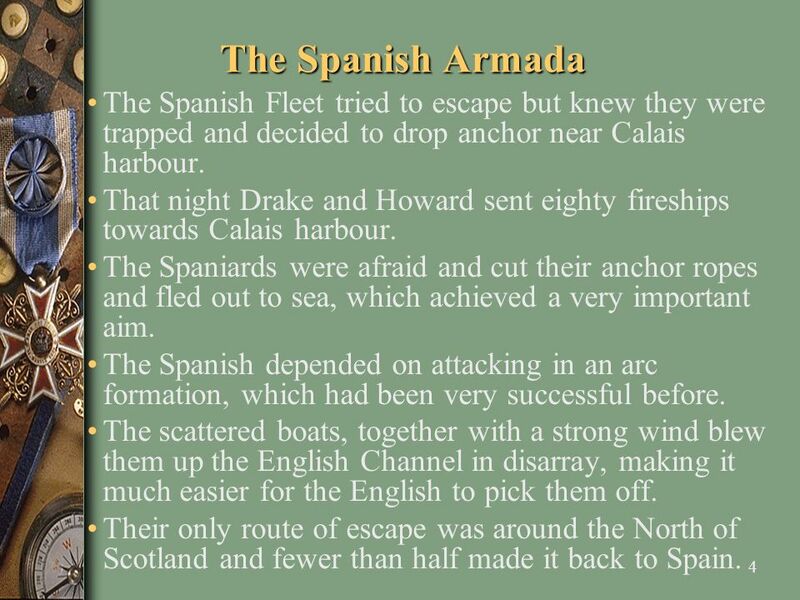 2 The Spanish Armada Although Drake could be said to be part of the cause of the attack by the Spanish fleet, or at least a pretty good excuse for it,( he had attacked the Spanish fleet in Cadiz) he came out as the hero of day! Remember the underlying reason was that the Catholics wanted to reclaim England for the faith. 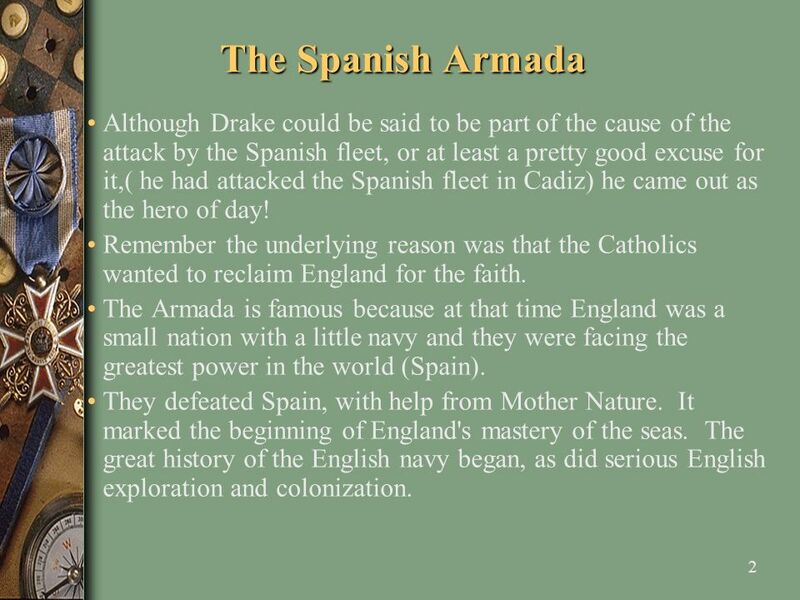 The Armada is famous because at that time England was a small nation with a little navy and they were facing the greatest power in the world (Spain). They defeated Spain, with help from Mother Nature. It marked the beginning of England's mastery of the seas. The great history of the English navy began, as did serious English exploration and colonization. 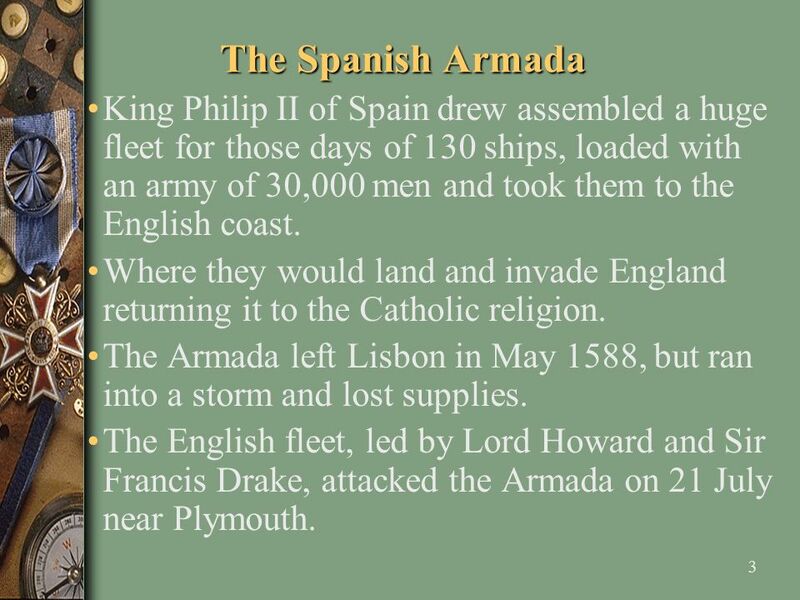 3 The Spanish Armada King Philip II of Spain drew assembled a huge fleet for those days of 130 ships, loaded with an army of 30,000 men and took them to the English coast. Where they would land and invade England returning it to the Catholic religion. The Armada left Lisbon in May 1588, but ran into a storm and lost supplies. The English fleet, led by Lord Howard and Sir Francis Drake, attacked the Armada on 21 July near Plymouth. 4 The Spanish Armada The Spanish Fleet tried to escape but knew they were trapped and decided to drop anchor near Calais harbour. 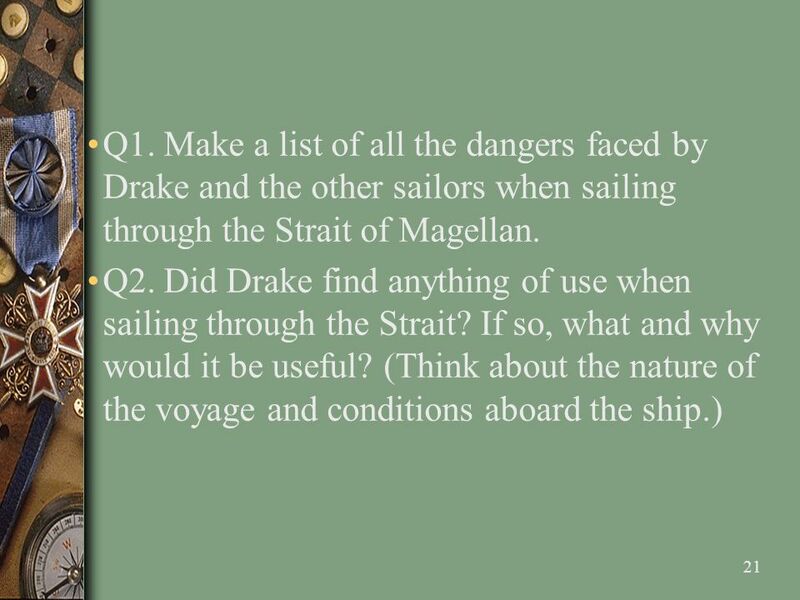 That night Drake and Howard sent eighty fireships towards Calais harbour. The Spaniards were afraid and cut their anchor ropes and fled out to sea, which achieved a very important aim. The Spanish depended on attacking in an arc formation, which had been very successful before. 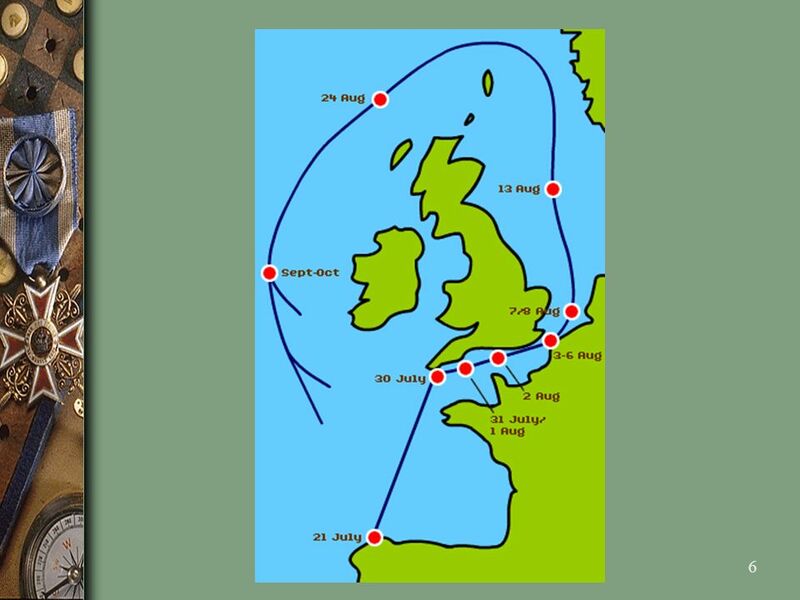 The scattered boats, together with a strong wind blew them up the English Channel in disarray, making it much easier for the English to pick them off. Their only route of escape was around the North of Scotland and fewer than half made it back to Spain. 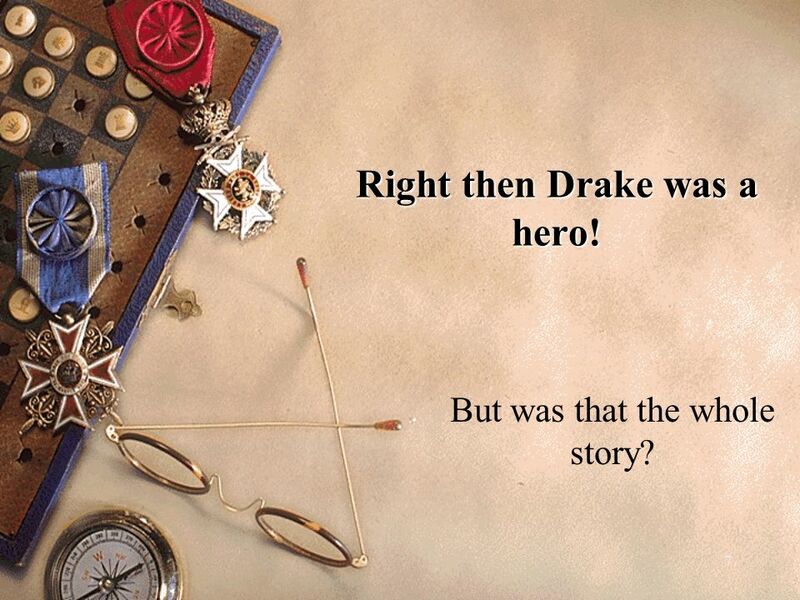 7 Right then Drake was a hero! But was that the whole story? 8 Was he the 'Master Thief of the Unknown World'? 10 Why did he go? 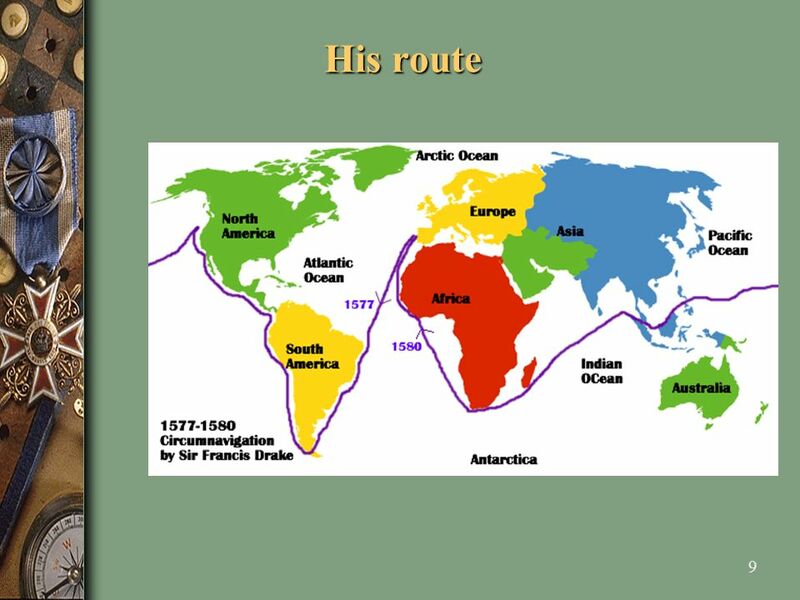 Nobody really knows why Francis Drake decided to sail around the world. Voyages of discovery and exploration were becoming more common as powerful nations sponsored journeys to find new land and trade routes. Kings, queens and other leaders wanted their share of the riches coming from trade in gold, silver, silk, spices and other exotic goods. Much of the trade was controlled by the Spanish and Portuguese but this did not please England. 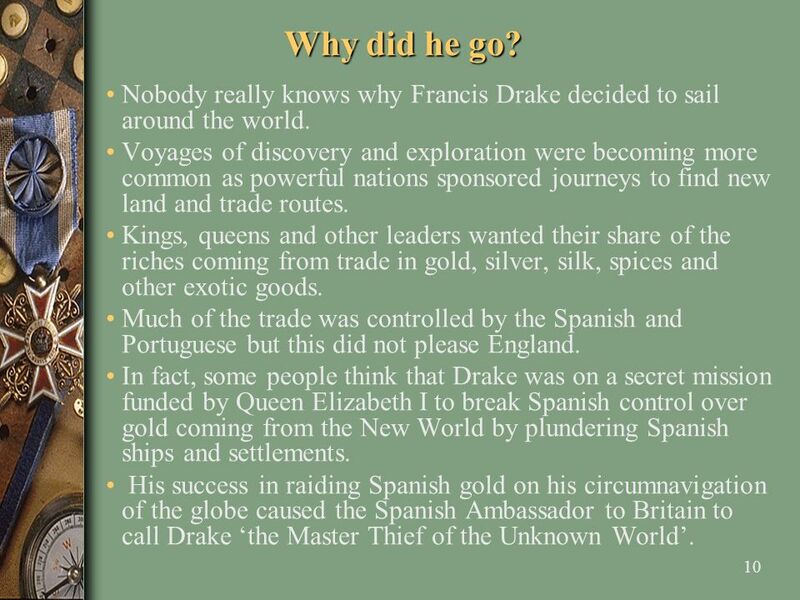 In fact, some people think that Drake was on a secret mission funded by Queen Elizabeth I to break Spanish control over gold coming from the New World by plundering Spanish ships and settlements. 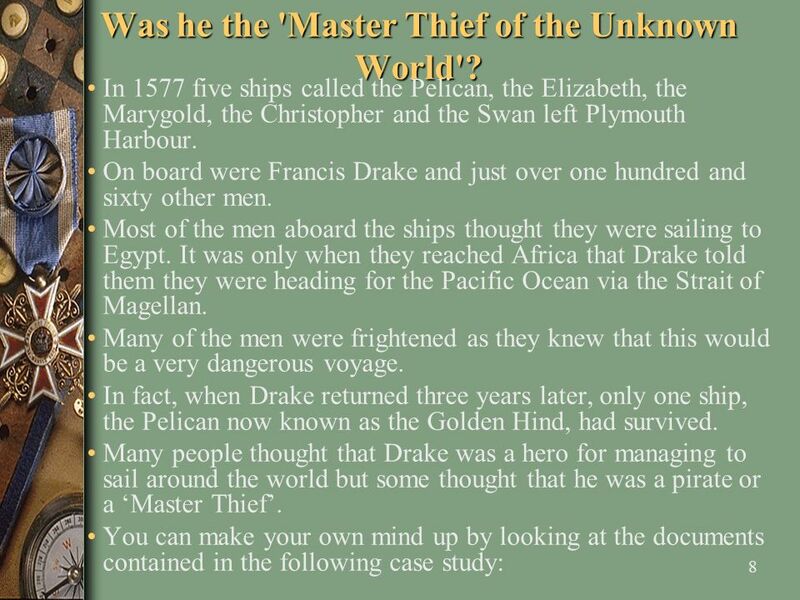 His success in raiding Spanish gold on his circumnavigation of the globe caused the Spanish Ambassador to Britain to call Drake ‘the Master Thief of the Unknown World’. 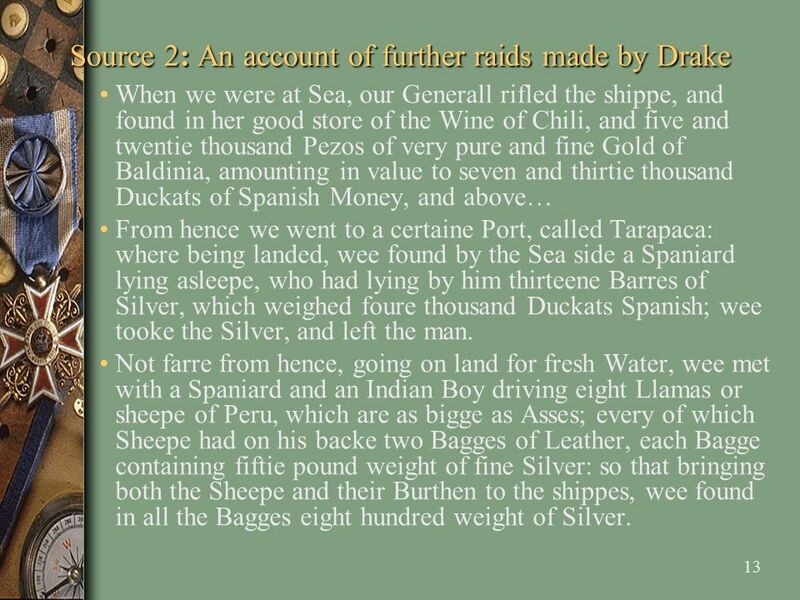 When wee came thither, wee found indeede the shippe riding at anchor, hauling in her eight Spaniards and three Negroes, who thinking us to have beene Spaniards, and their friends, welcommed us with a Drumme, and made ready a Bottya, of Wine of Chili, to drink to us. But as soone as wee entred, one of our company, called Thomas Moone, began to lay about him, and strucke one of the Spaniards, and said unto him, Abaxo Perro, that is in English, Goe downe Dogge. One of these Spaniards seeing persons of that qualitie in those seas, all to crossed and blessed himselfe: but to be short, wee stowed them under Hatches, all save one Spaniard, who suddenly and deliberately leapt over-boord into the Sea, and swam ashore to the Towne of S.Iago, to give them warning of our arrivall. They of the Towne being not above nine Households, presently fled away, and abandoned the Towne. 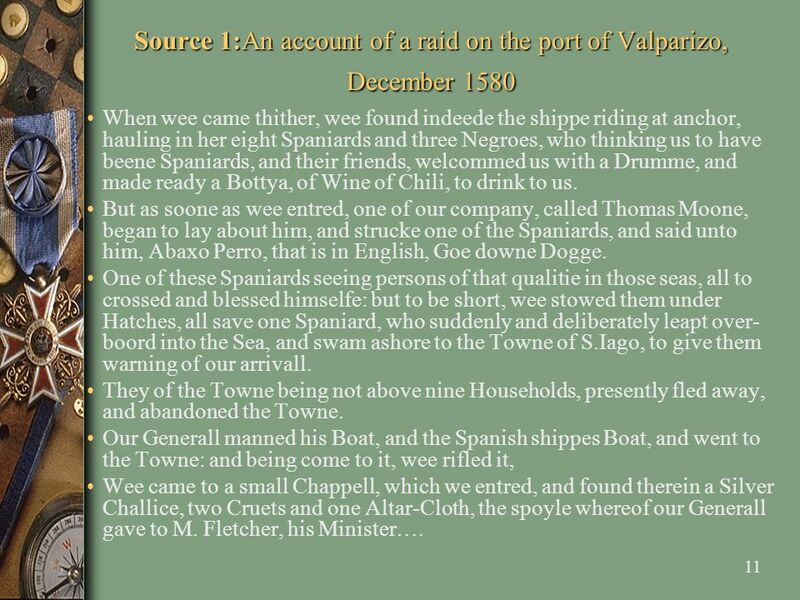 Our Generall manned his Boat, and the Spanish shippes Boat, and went to the Towne: and being come to it, wee rifled it, Wee came to a small Chappell, which we entred, and found therein a Silver Challice, two Cruets and one Altar-Cloth, the spoyle whereof our Generall gave to M. Fletcher, his Minister…. 12 Q1. 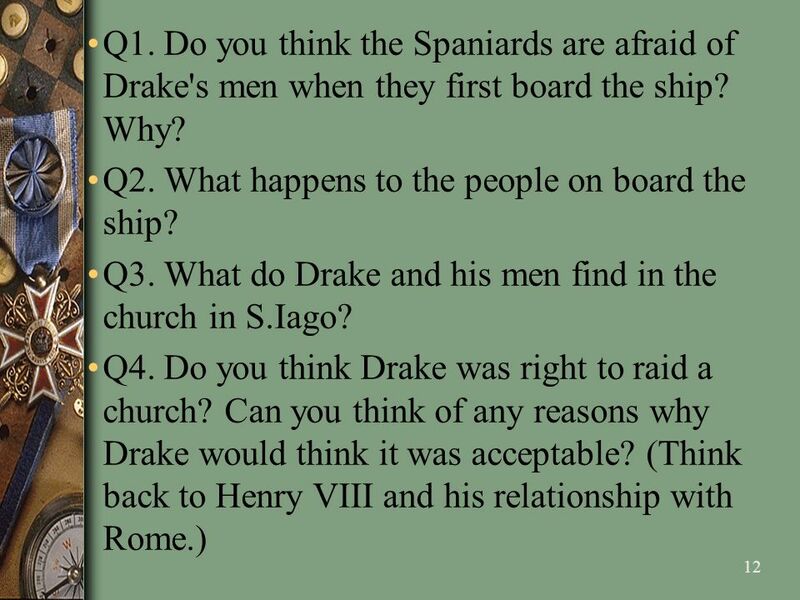 Do you think the Spaniards are afraid of Drake's men when they first board the ship? Why? When we were at Sea, our Generall rifled the shippe, and found in her good store of the Wine of Chili, and five and twentie thousand Pezos of very pure and fine Gold of Baldinia, amounting in value to seven and thirtie thousand Duckats of Spanish Money, and above… From hence we went to a certaine Port, called Tarapaca: where being landed, wee found by the Sea side a Spaniard lying asleepe, who had lying by him thirteene Barres of Silver, which weighed foure thousand Duckats Spanish; wee tooke the Silver, and left the man. Not farre from hence, going on land for fresh Water, wee met with a Spaniard and an Indian Boy driving eight Llamas or sheepe of Peru, which are as bigge as Asses; every of which Sheepe had on his backe two Bagges of Leather, each Bagge containing fiftie pound weight of fine Silver: so that bringing both the Sheepe and their Burthen to the shippes, wee found in all the Bagges eight hundred weight of Silver. Hence we sayled to a place called Arica: and being entred the Port, wee found there three small Barkes, which wee rifled, and found in one of them seven and fiftie Wedges of Silver, each of them weighing about twentie pound weight; and every of the these Wedges were of the fashion and bignesse of a Brick-bat. 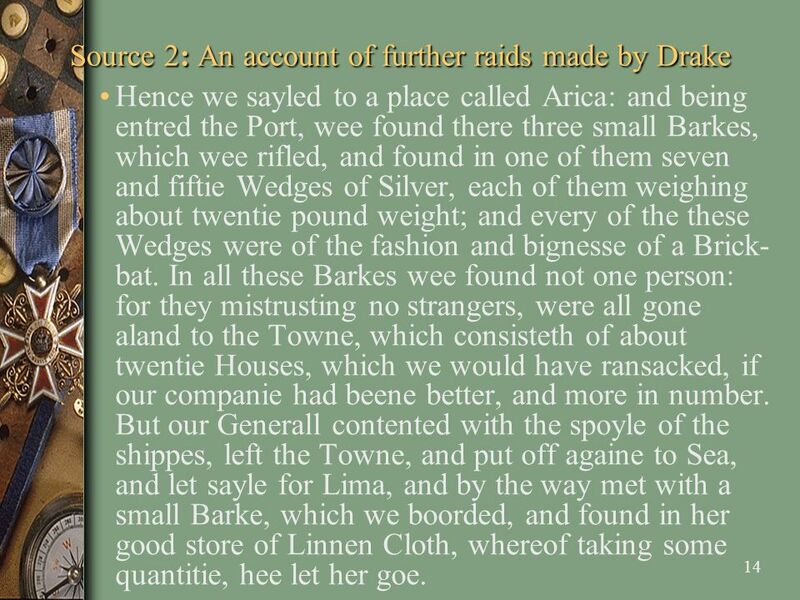 In all these Barkes wee found not one person: for they mistrusting no strangers, were all gone aland to the Towne, which consisteth of about twentie Houses, which we would have ransacked, if our companie had beene better, and more in number. 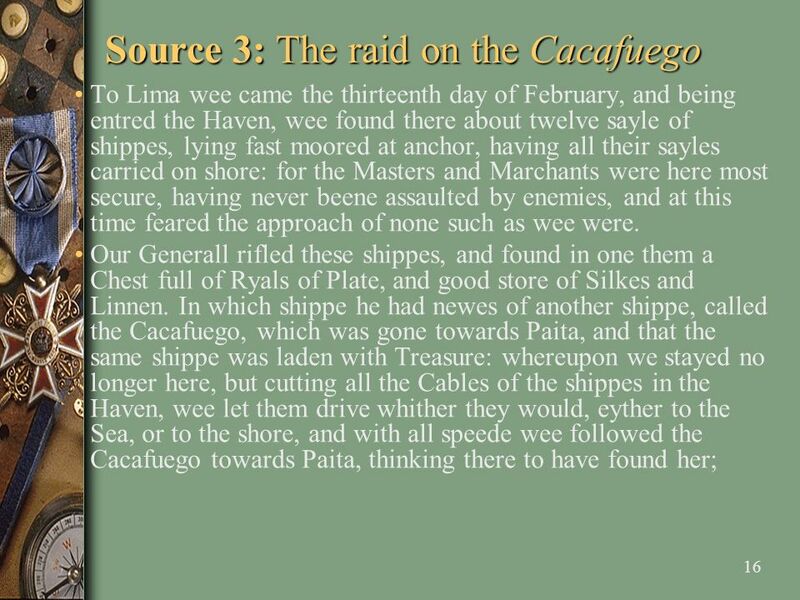 But our Generall contented with the spoyle of the shippes, left the Towne, and put off againe to Sea, and let sayle for Lima, and by the way met with a small Barke, which we boorded, and found in her good store of Linnen Cloth, whereof taking some quantitie, hee let her goe. But before wee arrived there, shee was gone from thence towards Panama: whom our Generall still pursued, and by the way met with a Barke laden with Ropes and Tackle for shippes, which he boorded and searched, and found in her fourscore pound weight of Gold, and Crucifixe of Gold, with goodly great Emeraulds set in it, which hee tooke, and some of the Cordage also for this owne shippe. 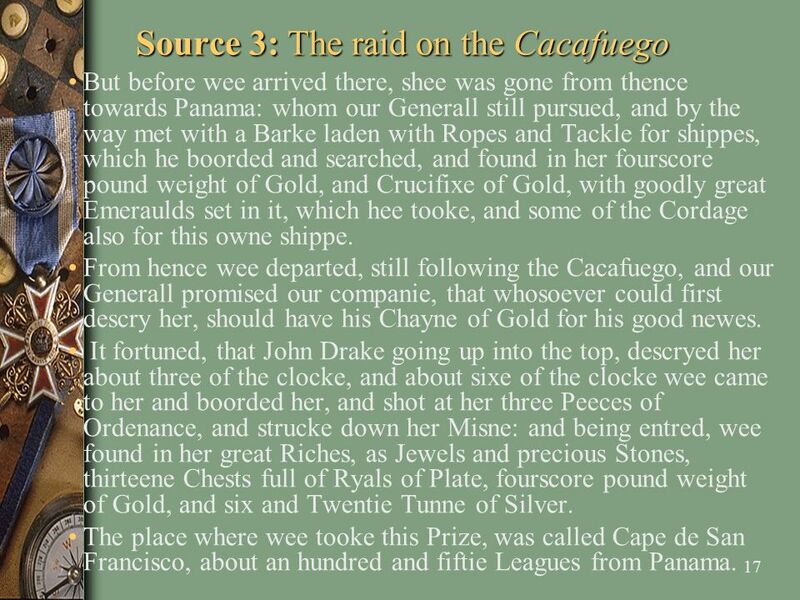 From hence wee departed, still following the Cacafuego, and our Generall promised our companie, that whosoever could first descry her, should have his Chayne of Gold for his good newes. It fortuned, that John Drake going up into the top, descryed her about three of the clocke, and about sixe of the clocke wee came to her and boorded her, and shot at her three Peeces of Ordenance, and strucke down her Misne: and being entred, wee found in her great Riches, as Jewels and precious Stones, thirteene Chests full of Ryals of Plate, fourscore pound weight of Gold, and six and Twentie Tunne of Silver. The place where wee tooke this Prize, was called Cape de San Francisco, about an hundred and fiftie Leagues from Panama. 18 Q6. 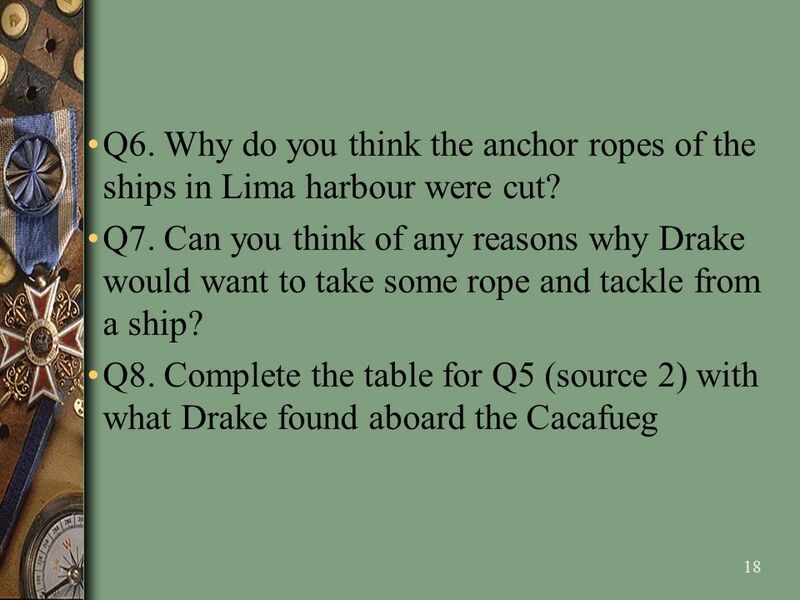 Why do you think the anchor ropes of the ships in Lima harbour were cut? 19 Was it a Voyage of Discovery? 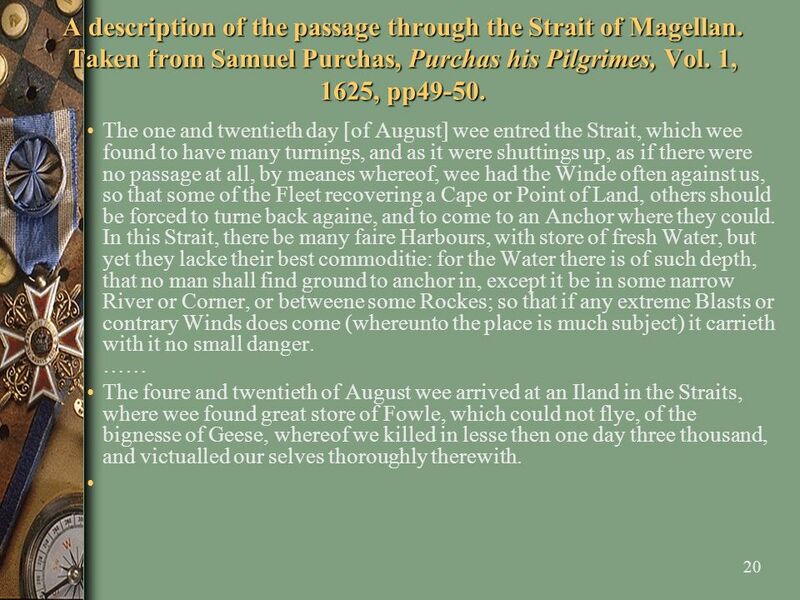 A description of the passage through the Strait of Magellan. Taken from Samuel Purchas, Purchas his Pilgrimes, Vol. 1, 1625, pp49-50. The one and twentieth day [of August] wee entred the Strait, which wee found to have many turnings, and as it were shuttings up, as if there were no passage at all, by meanes whereof, wee had the Winde often against us, so that some of the Fleet recovering a Cape or Point of Land, others should be forced to turne back againe, and to come to an Anchor where they could. In this Strait, there be many faire Harbours, with store of fresh Water, but yet they lacke their best commoditie: for the Water there is of such depth, that no man shall find ground to anchor in, except it be in some narrow River or Corner, or betweene some Rockes; so that if any extreme Blasts or contrary Winds does come (whereunto the place is much subject) it carrieth with it no small danger. …… The foure and twentieth of August wee arrived at an Iland in the Straits, where wee found great store of Fowle, which could not flye, of the bignesse of Geese, whereof we killed in lesse then one day three thousand, and victualled our selves thoroughly therewith. 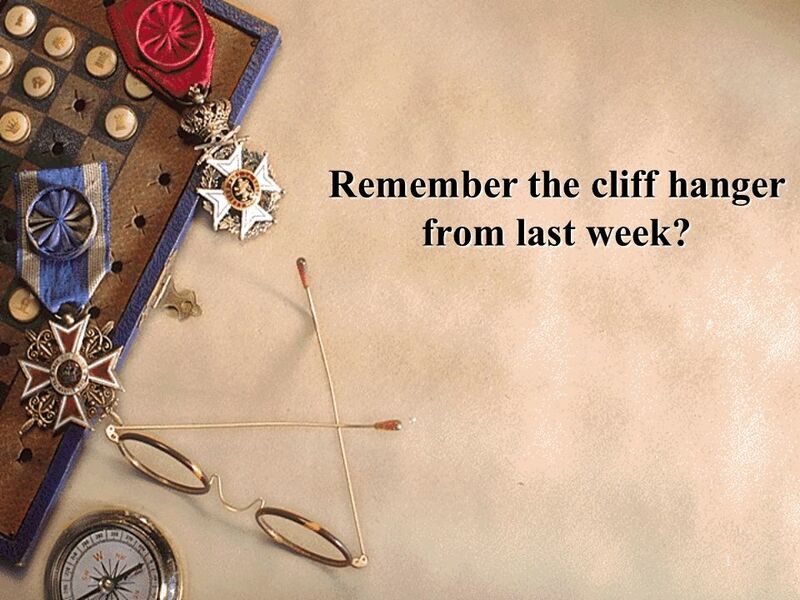 Download ppt "Remember the cliff hanger from last week?" Francis Drake: Pirate, Explorer or Privateer? ACTIVITY 3: HISTORICAL ENQUIRY. 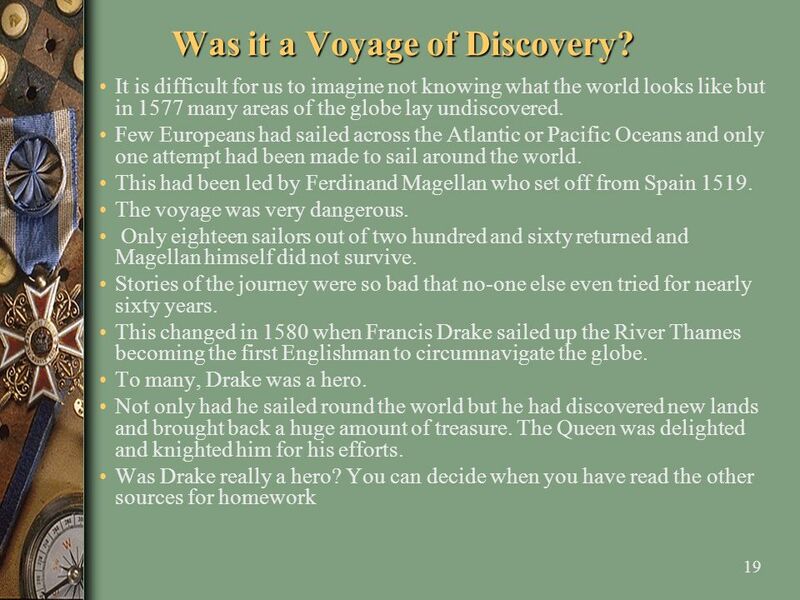 The life and explorations of Sir Francis Drake By Taran, Aiden and Luke. 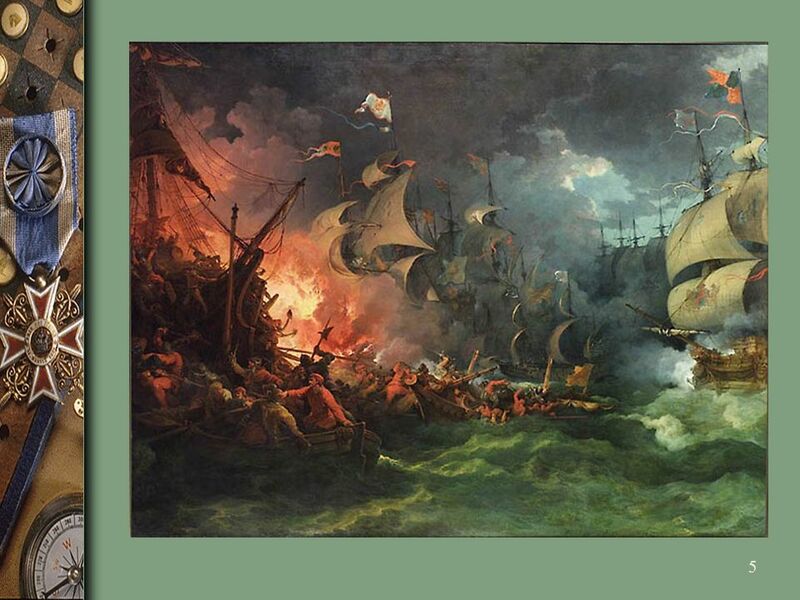 Spanish Armada American History Mrs. Cady Review In the late 1400’s many countries began to explore. They included Portugal, Spain, France, and England. The Spanish Armada. Review In the late 1400’s many countries began to explore. They included Portugal, Spain, France, and England. Exploration could led. HOW DID THE LANGUAGE OF THE UNITED STATES OF AMERICA BECAME ENGLISH? 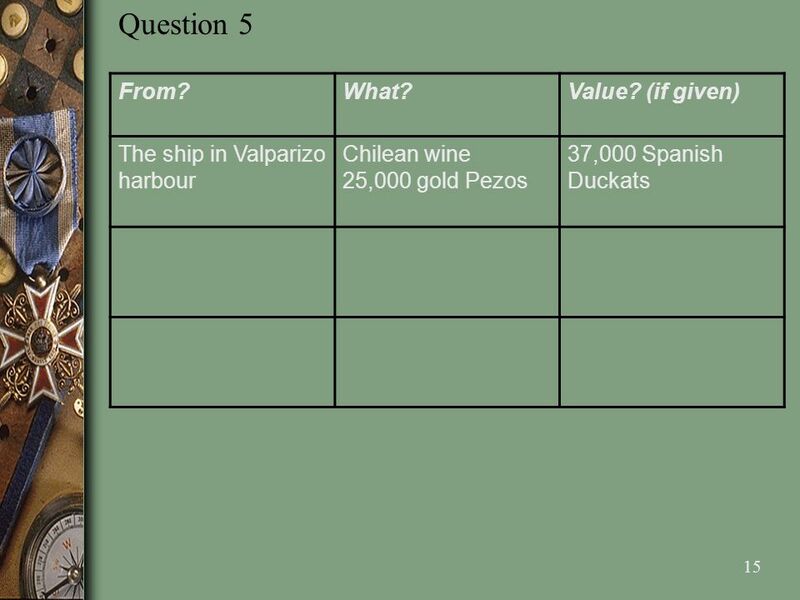 Unit 19: What were the effects of Tudor exploration? Put together by Nolan Rachocki. Francis Drake was born in Tavistock, Devon. He was the eldest of the twelve sons of Edmund Drake. Because of religious. 1451 Columbus born between 22 August and 31 October in Genoa, Italy His family moved to Savona and he travelled the seas as a pirate attacking ships.  People in Europe wanted goods from Asia. Italy and Egypt controlled the trade routes and charged high prices.  Christians wanted to spread their ideas. Warm Up Describe the Protestant Reformation. In your explanation, be sure to mention the following: Martin Luther Printing Press 95 Theses Protestants.